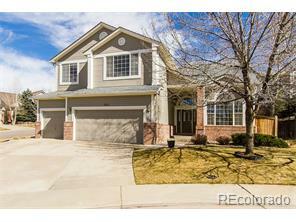 Cherry Creek High School and family friendly neighborhood! Dramatic two story entry, beautiful hardwood floors, open flow floor plan, formal living and dining rooms and French doors to a private study. Bright and sunny family room with soaring ceiling and windows accented by a visually inviting brick fireplace wall. Spacious kitchen, new stainless steel appliances, slab granite counter and breakfast nook. 4 large bedrooms upstairs, including spacious Master suite. Finished basement with recreation room, 5th bedroom, full bath and an abundance of storage space. Private fenced yard, 3 car garage on lovely cul-de-sac. Convenient to Light Rail and shopping.